My host for dinner in her Paris apartment. For some solo travelers the prospect of eating alone is the most daunting aspect of a trip. You don’t have to eat alone. A solo traveler can have company for dinner even if she or he doesn’t know anyone in town. There are many options beyond the typical restaurant for your noon or evening repasts. There are some really fun and interesting ways to have a social dining experience when traveling solo. Here are six from Tracey and my travels. This is a perfect evening for a solo traveler. Whether you’re exploring your own country or have gone much farther afield, buying an“eat with a local” package takes you into the homes of locals to eat what they eat, see how they live and discuss life with people far from your everyday social circle. Eating with a local not only gives you a social eating experience, it brings you closer to your destination and delivers new perspectives on the world. 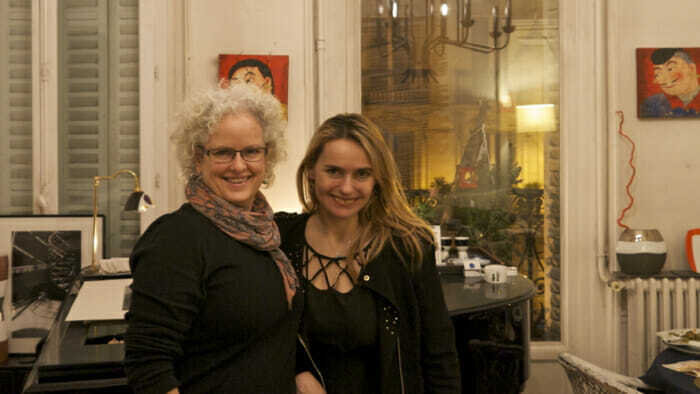 In Paris I ate at the home of Sasha, a concert pianist. There is often more than one traveler in attendance at these dinners but on the occasion I was at Sasha’s I was the only guest. When this happens she invites a friend along. The evening was an absolute delight. I’ve done a few themed dinners and I find them a lot of fun. They are not meant to be serious or great theatre. They’re a lark. 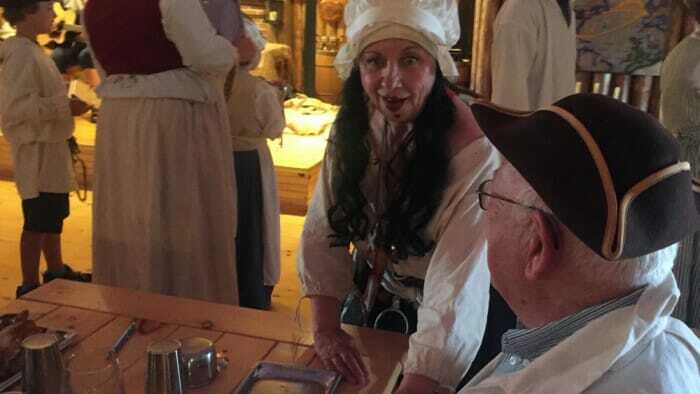 This photo is of Sabine at the Beggar’s Banquet in Louisbourg, Nova Scotia. She was an incredible flirt and had the attention of the room. In Louisbourg, Nova Scotia I had dinner at the Beggars Banquet at The Point of View Suites. What a good time! When you arrive they dress you in an 18th century costume. You’re then seated at communal tables with other guests. They sat me at a table with a family of three and another solo woman. There’s constant entertainment. At $39.95 for a lobster, snow crab, halibut or chicken meal including salads, dessert and coffee it’s great value. Add to that the music, dancing and fun and it’s a really good time. So, are there other themed dinners you can go to? Yes there are samurai-themed dinners in Tokyo and Tango-themed dinners in Uruguay and dinner and jazz concerts in Paris. Check out the many themed dinners here. On this cruise I learned that I had been cooking lobster all incorrectly all my life. Argh! But what a pleasure to learn the right way and to learn in such an entertaining way. As is typical, this dinner cruise was set up with communal tables. 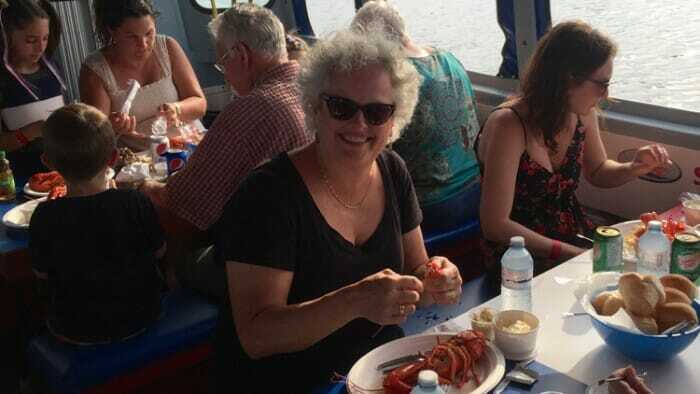 I took the two-hour Lobster Tales cruise in Sediac, New Brunswick. It was really well done with Captain Ron educating and entertaining us about lobsters – how they live, mate, are caught and how we should cook and eat them. Ron is a classic storyteller. He knows how to hook you in. The food was delicious and I learned a better way to cook lobster. A cruise can’t afford to leave a seat unsold so communal tables are the way they are organized. I sat with a family of four from Florida. A dinner cruise is definitely a great option for solo travelers. In London, in San Francisco, in Shanghai – there are dinner cruises all over the world. Check them out here. Cooking classes are a great way to learn about local foods and flavors as well as meet new friends and, at many classes, enjoy the results of your effort too. So what about taking a cooking class at your destination, meeting a few new friends and sitting down to eat with them at the end. 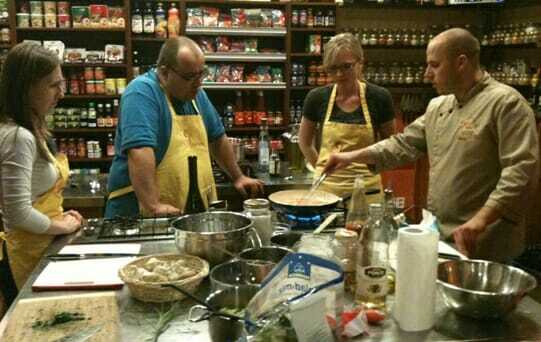 To find a cooking class click here. This goes to a listing of classes all over the world. Just change the search to “cooking class ‘your destination'” to find options for you. Please read the offer carefully to confirm that a meal is shared in the end. Dinner shows can be great or they can be really cheesy. Read reviews carefully. Dinner shows are another great option for solo travelers as the management will put you at a table with others so that they can sell as many tickets as possible. But, as the caption above says, you need to be careful with dinner theatre. I went to a traditional jazz club in Havana and the dinner show was great. 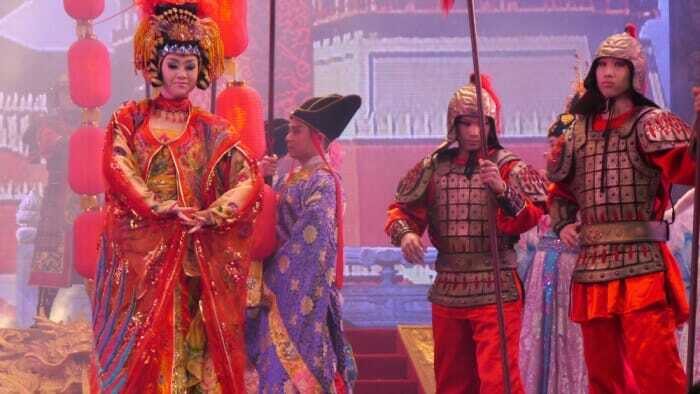 The image above was taken from a trip to China where the show involved an overview of Chinese theatre designed specifically for tourists. I didn’t enjoy it. Check out the options for dinner shows here and read the reviews carefully. The choices you make as you plan your trip can have a big impact on how social your meals will be. Here are a few more tips to help you avoid dining alone. Take a River Cruise. River ships are not large so it’s easy to connect into the community that forms over the course of a trip. I’ve taken two river cruises and on both occasions I made a point of sitting down with a different group at just about every meal. Read Solo on a River Cruise: Enjoy Both Social and Alone Time. Stay at hostels. Communal tables are common at hostels and meeting and chatting with new people is a social norm. I really do like hostels. I just returned from the Isle of Skye where I stayed at one for four nights, saved a lot of money by using their kitchen and met people from Germany, Canada, Poland and, of course, the UK. To know more about the hostel experience read: Sleeping with Strangers: The Hostel Experience. Eat at the bar. When considering where to eat I look for a restaurant with communal tables or, at the least, a bar. I find sitting at the bar it’s quite natural to start talking with your neighbors. For more on not eating alone when traveling solo read Eating Alone is Easy When You Know How and Travel Alone and Love it: 50 tips (Revised and Updated).